Everyone loves a royal wedding but did you know Princess Anne’s has a special connection to Hull….. The marriage of Princess Anne on 14th November 1973 to Captain Mark Phillips was an occasion celebrated by the entire nation. The big surprise was that Princess Anne chose the ready-to-wear designer Maureen Baker to fashion her gown. The Queen’s 1947 wedding dress was designed by the royal couturier, Norman Hartnell. Designing for the family since 1938 some suggested that a couturier would have been more appropriate. But by going to Maureen Baker Princess Anne was proving she was a thoroughly modern gal. Princess Anne loved Maureen Baker. She headed up the British fashion label Susan Small making clothes for Princess Anne before producing a selection of designs for her wedding day. 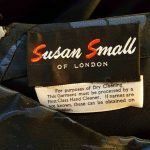 Susan Small, a label well known in Britain. 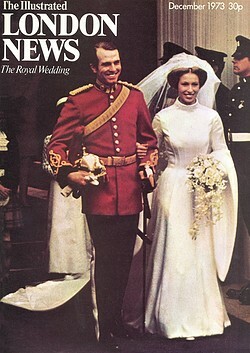 Maureen Baker chief designer also designed Princess Anne’s wedding dress in 1973. Image courtesy circavintage.com. Princess Anne’s dress is distinctive. Breaking with the traditional skirt and boned bodice seen in previous royal weddings she chose a design that was medieval in inspiration. Susan Small the label had designed eye catching fashion for the British woman for almost 40 years. 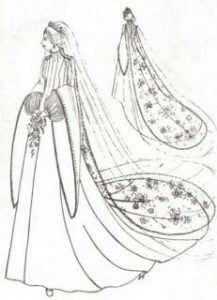 The gown Princess Anne chose was the 4th suggested design. Fashion in the early 1970s was fluid and there were many differing trends, the medieval look was one. By then expressing individual choice and taste was more acceptable than slavishly following what Paris or London dictated. In choosing a medieval style gown Princess Anne was bucking traditional choices and expectations. She had a hand in its look and was going for a dress that was entirely her own. The news reports show a relaxed, understated wedding day in contrast to the pomp and circumstance of her mother’s. J.A. Milne Director of Hull’s Leisure Services visited the gown on display while on a family holiday in Edinburgh. As his daughter Hilary was photographed next to the dress he noticed how popular the exhibit was. It should be in Hull, he thought and made moves to make it happen. Once it had been agreed that Hull Museums would be its Yorkshire home Granville Proctor who made the gown travelled up to arrange the display. It was shown in a linked corridor between Wilberforce House and Georgian houses in the Old Town. On the first morning members of the public phoned up in their droves to ask how they could see the exhibit. They were told that the entrance fee was 20p for adults and 10p for children and they would arrive to find a queue! Unfortunately the shoes Princess Anne wore were not on display; they’d been taken on tour with her in Australia. But the train was. It was transparent and hung from the shoulder, decorated with sprays of silk orange blossom and embroidered with pearls and tiny mirrors. It was crafted by Lock’s embroiderers and glistened as she walked down the aisle. Princess Anne’s wedding dress signified a turning point in the Royal Family’s attitude towards tradition. The younger generation were allowed freedoms the rest of society had been permitted since the 1960s. With it launched a generation of women who loved the wedding dress so much, they wanted the style for their own. Anne Bartlett, daughter of House of Mirelle’s seamstress Betty was getting married in September 1974. She loved the Tudor style from the 1969 film Anne Of A Thousand Days and asked her mother whether she could design and make one for her special day. You can read more about the dress and Betty’s work as a dressmaker here. Princess Anne was also inspired and the result was groundbreaking. Displayed for all Yorkshire to see at Hull Museums the design of her dress captured royal heritage and design freedoms of modern times.